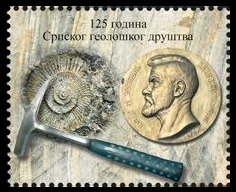 Serbia 2016 "Serbian Geological Society"
On February 23, Serbian Post Authority issued a single stamp to commemorate 125th Anniversary of the Serbian Geological Society. 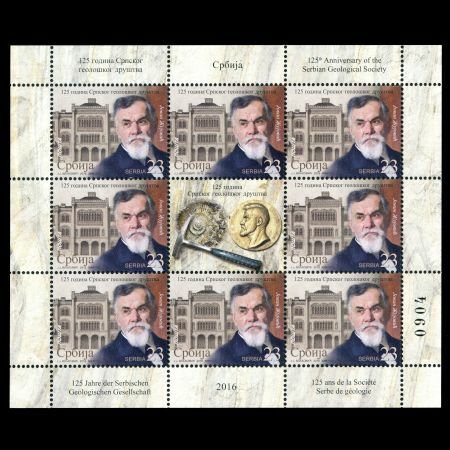 A building of the society is depicted on the background of the stamp, Jovan M. Žujović is on the foreground. Jovan M. Žujović (1856, Brusnica, Gornji Milanovac - Belgrade, 1936) was an anthropologist, known as a pioneer in geological and paleontological science in Serbia. 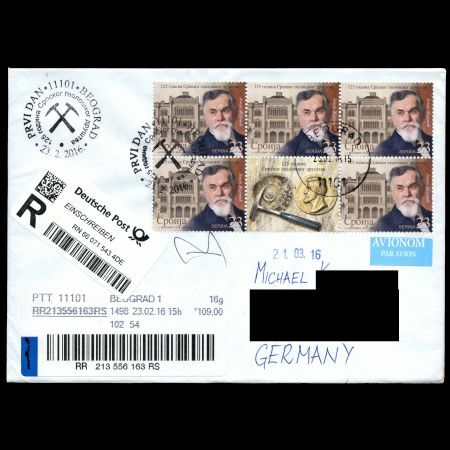 He is known, among other things, for his work in anthropology. In his book, Stone Age, published in 1893, relying mostly on French scientists, he reviewed the contemporary state of knowledge in paleoanthropology. Later, between 1927, and 1929, in the book Genesis of the Earth and Our Country, he wrote about the biological past of the Earth starting from the beginning of mankind. The work takes particular interest in the history of the Balkan peninsula. 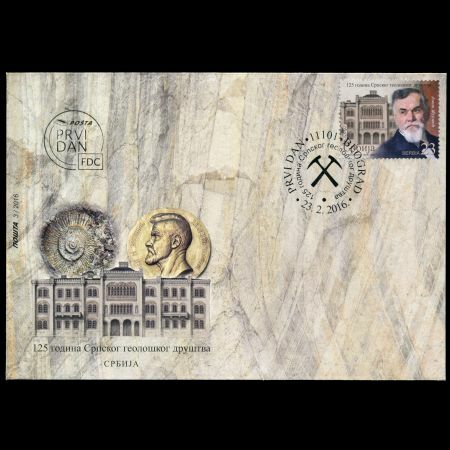 Motif on stamp: portrait of Jovan Žujović (painting by Uroš Predić) and Captain Misha’s Edifice Serbian Geological Society is one of our oldest scientific organizations and the first geologists’ society in the Balkans. At the time of its creation, there were only two more “learned societies” in Serbia – Serbian Medical Society and Serbian Archeological Society. In the premises of the Belgrade Higher School, on 23 February 1891 a meeting was held when the participants decided to found a society with the primary task “to perform geological investigations of Serbia and other countries of the Balkan Peninsula and to inform its members and other interested parties about the achievement in the field of geology and affiliated sciences.” The name of the society was given by Sima Lozanić, a professor of chemistry at the Belgrade Higher School during his lectures in Germany. 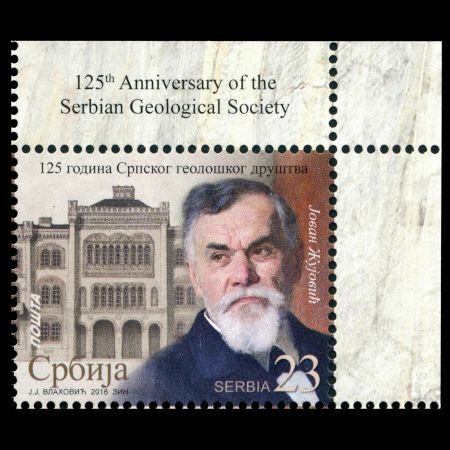 The members of the Serbian Geological Society were many great scientists and explorers, who left an important mark in Serbian and world science: Jovan Žujović (the founder of the Society, minister in several governments, rector of the Higher School, president of the Serbian Royal Academy), Jovan Cvijić (president of the Serbian Royal Academy), Sava Urošević (rector of the Higher School), Milutin Milanković (world authority in the field of climate and celestial mechanics), Vladimir Laskarev (one of the most eminent European geologists). Many initiatives were taken at the Serbian Geological Society and one of the most important was a systemytic geological mapping of our country, the result of which was the Basic Geological Map of the entire territory of the ex – Yugoslavia, completed in the 1970s. Seismological Institute, Museum of Natural History, Geological Institute in Belgrade, as well as other scientific societies in Serbia were founded at the initiative of the Society’s members. In its history, the Society has become an active member of many international organizations where the views of geologists and geology of Serbia are supported: International Union of Geological Sciences, Association of European Geological Societies, European Federation of Geologists and Carpathian Balkan Geological Association.